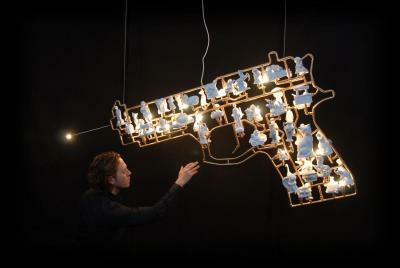 The Gun by Segall is part of his latest series 'Recycled Waste'. In continuation to Recycled Symbols, the first pieces belonging to the series Recycled Waste also consist of a symbolic frame loaded with nostalgic porcelain figurines. In contrast, usage of other materials and colours to accentuate its frame results in a different sense of decadence; instead of a chrome golden layer reflecting a sweet and valuable sense of decadence, by using a black tarry layer with the formation of little drops, as a direct reflection of our need for excessive consumption, a morbid sense of decadence is established. The porcelain figurines are connected to the frame with the same black tarry substance. However, the massive constellation of porcelain figurines resists this frame’s swallowing character. In time, the symbolic frame is replaced by a pile of waste, which is derived from Segall’s own consumption. The blood-red immersed artist’s waste reinforces the nostalgic image of a small white porcelain sculpture. And so a new destination is found for those old-fashioned figurines. Or will it eventually become part of our waste?